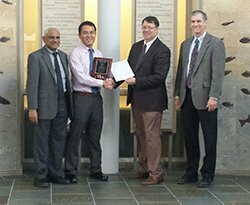 Bodycote, the world’s largest provider of heat treatment and specialist thermal processing services, is pleased to announce that this year’s winner of the Bodycote ‘Best Paper in Heat Treating’ Award, has been presented to Gaosong Yi, a Ph.D. student in Metallurgical Engineering at the University of Utah, for his paper entitled “Effect of Pretreatment on the Sensitization Behavior of Al 5083 H116”. The award, established in 1997 by the ASM Heat Treating Society, recognises research which advances or promotes heat treating technology in a meaningful way or improves the management of the heat treating business. Bodycote sponsors the award; and the winner receives a recognition plaque and $2,500. Mr. Yi’s paper addressed how to use pre-treatment methods to improve the corrosion resistance of AL 5083 alloy. In his research, he found that the corrosion resistance property of AL 5083 alloy can be highly enhanced by holding the temperature at 250 °C for 24 hours as demonstrated by ASTM-G67 test results.